Hungary's parliament has overwhelmingly passed a new set of laws which criminalize aiding illegal immigration with fines and jail time. The laws, which were passed yesterday on the UN's "World Refugee Day," send a strong message that Hungary will not take part in the EU's forced collective suicide. Parliament on Wednesday passed the "Stop Soros" package of laws that penalise activities in support of illegal migration. Lawmakers also passed the�constitutional amendment on "the preservation of Hungary's Christian culture". The bills contain amendments to the penal code that sanction entities or organisations that "facilitate illegal migration" or help with the asylum application procedures of migrants arriving from safe countries. The bills define the promotion of illegal migration as an organised activity which helping a person not in danger of persecution to submit an asylum request or to obtain a title of residence. Financially supporting illegal migration, gaining from it financially or undertaking such activities within 8km of the border are punishable with one year's prison sentence. Under the new law, surveillance of the border, gathering or distributing information, and setting up or running a network will also qualify as organisation of migration. The Stop Soros bill was passed 160 to 18. On Tuesday, the government submitted a bill seeking to introduce a 25 percent special tax on organisations that support migration with a view to contributing to government spending on the handling of migration. Revenue from the tax will be spent exclusively on border protection measures, according to the bill. Lawmakers also passed a government-initiated constitutional amendment on "the preservation of Hungary's Christian culture", the creation of an administrative high court and on banning homelessness. The amendment also declares the protection of Hungary's constitutional identity as a duty of the state. It also states that foreign nationals cannot be resettled in Hungary. The amendment requiring a two-thirds majority was passed with 159 votes in favour and 5 against. It was supported by the ruling parties, Jobbik, Dora Duro and Imre Ritter. Akos Hadhazy and the representatives of the Parbeszed group voted no. MSZP and LMP had previously said that they would stay away from the vote, and DK lawmakers didn't vote either. Under its terms, aid workers suspected of �enabling illegal immigration� could be barred from border areas at the authorities� discretion. Activists fear that this could be used against watchdog groups and journalists keeping an eye on Hungarian authorities. The law also grants the authorities permission to deny asylum claims to migrants who arrive from a country other than their own. �We want to use the bills to stop Hungary from becoming a country of immigrants,� said Interior Minister Sandor Pinter. So far, Orban appears to be winning. 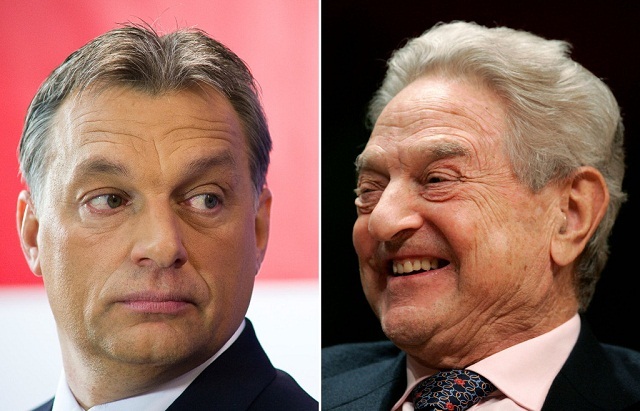 Soros� Open Society Foundations ended its operations in Hungary this April, citing �an increasingly repressive political and legal environment in Hungary.� The Hungarian government had previously hinted that Soros� NGO could be punished under the new law. �If Soros is found to have engaged in such activity, meaning he organizes illegal immigration, then the rules will apply to him,� government spokesman Zoltan Kovacs said in February. In addition to the �Stop Soros� law, the parliament also passed a constitutional amendment on Wednesday stating that an �alien population� cannot be settled in Hungary, a rebuke of the EU�s plan to impose resettlement quotas on member states. It's hilarious watching leftists who whine all day about "Russkie meddling" advocating in favor of Soros' spending $32 billion to meddle in the affairs of the United States and Europe!